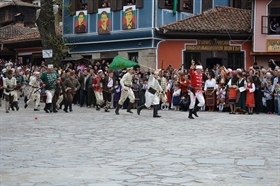 Various initiatives throughout Bulgaria are to mark today the 143. anniversary since the April Uprising. The rebellion burst out on April 20, 1876 in the town of Koprivshtitsa. It was a mass armed upsurge of the Bulgarians in the Ottoman Empire aiming at the liberation from Ottoman rule, but failed to reach military success. Nevertheless it represents a peak in Bulgaria’s national liberation movement, as it reached its political goal – to cause strong repercussions in West Europe and Russia.